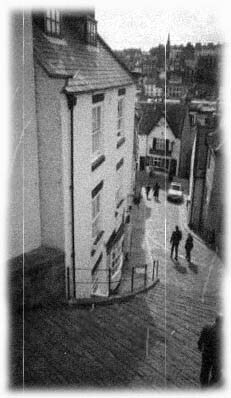 The Whitby Gothic Weekend (WGW) started almost by accident in 1994 when a goth lady called Jo Hampshire decided to go on holiday to Whitby. The fact that it is legendary for being the landing place of Dracula didn't come into it - Jo just fancied a seaside holiday. Several friends decided to come along with her and in the end she invited some more and told them to 'bring a crowd'. When 200 goths tried to all get into the pub simultaneously on the first evening, it was clear that there was something of an enthusiasm for an event where goths effectively went on holiday. Jo Hampshire (Top Mum) is the top "person behind it all" of the weekend. Every year she has put together a well-rounded weekend to please everyone from the net.goths to the Vampire Society and all in between. Jo has organised more and more activities, and the Weekend now has a full three days of events, including bands, DJs, a market, annual competitions, and of course, a certain amount of time is spent enjoying the seaside attractions of Whitby itself. Jo has soothed the locals' fears, tried to give the press a correct picture of goth and has booked some of the creme de la creme of goth bands. 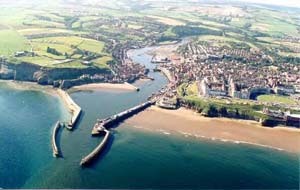 Whitby was also a location in the "Dracula" novel - the spot that Dracula's boat landed in England. There is a museum and related Dracula items are available - vampire fudge, anyone? Whitby has many other attractions: touring St. Mary's church and graveyard, visiting the Captain Cook Museum, hiking up to the 13th/14th century Abbey, admiring the architecture, and looking into the art galleries, museums and jet works (the stone, not the engine). "I just don't like going to things which are like that." It was all Jo Hampshire's idea. Back in 1994, Jo was living in a small village near Barnsley, in Yorkshire - an out-of-the-way area of the UK without the slightest shred of a goth scene. As Jo herself puts it: "I didn't *know* anyone!" 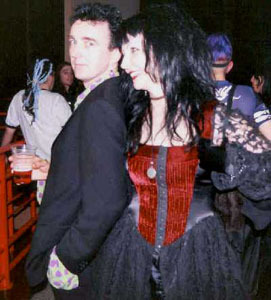 From time to time, Jo would travel to goth events in other parts of the UK - quite often to the goth nights that were then running at the Rock City club in Nottingham. 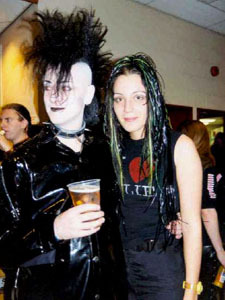 Jo started to meet other goths who were doing much the same thing as she was - travelling around to attend goth events because there was nothing happening in their own home areas. 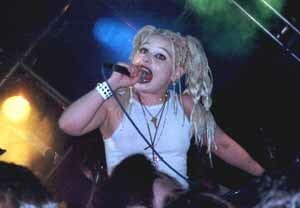 At that time, the UK goth scene was at a low ebb. 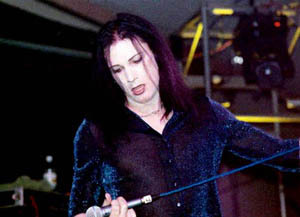 The original post-punk scene was long gone, and the later 'Gothic Rock' period, when bands such as The Mission and Fields Of The Nephilim had taken a more straightforward rock-based version of goth into the charts, was quietly dying out as the bands made deliberate shifts away from goth, or simply coasted to a halt. The 'underground' goth scene, which essentially created the scene we know today, had not yet kicked off. If you wanted to experience goth-stuff in the UK in the early 90s, you frequently had to travel to the few events that were still running. Jo realised that there were probably quite a few goths in the same position as she was - all dressed up with all too few places to go. Wouldn't it be great to bring a bunch of goths together, in a suitably atmospheric location, and just have a party? That simple notion was the idea which became the Whitby Gothic Weekend. "I first found out about Whitby in its very formative stages - when I was chatting to Jo at Rock City in Nottingham. She asked me what I thought of her idea to bring everyone together for a party (she hadn't decided upon the venue at that point). I remember saying that it would be a winner. The scene was starting to tail off badly and bands such as ourseleves were beginning to wonder where our impetus was. To a certain extent, Jo provided it." "I was running Crimson magazine at the time, and Jo contacted me regarding the idea she had of organising a weekend festival in Whitby with a few bands. She asked if I could mention it in the magazine and help publicise it. I was only too willing to support any venture like that so the rest became history!" The small scale of the very first Whitby Gothic Weekend now seems almost incredible, given the way in which the event has grown over the years. Jo's original idea essentially envisaged a small group of goths having a party in a pub - nothing more elaborate than that. What actually happened took everyone by surprise. "I can remember seeing The Elsinore where the bands were playing and thinking...they've got to be kidding! I thought someone must have been having a laugh, but then I'm sure Jo thought the same when she first saw it too - it wasn't big enough to fit the bands in, let alone the crowd!" "It was a bizarre night - if I can recall correctly, we were all skint and could only get a van for the Friday evening, so we drove from Nottingham to Whitby - made our way to Elsinore and set up camp in the corner of what must have been the busiest pub ever. There was no stage as such and the crowd were right on the other side of my mic stand. I thought at that point 'This could be the beginning of something' - because there was a vibe and atmosphere that none of us had experienced before." "I think everyone was amazed just how many people went... I think people were expecting to turn up and find just a handful of other goths. As it was, the idea had captured a lot of people's imaginations. A bigger venue was quickly found for the second night, and even that was seriously too small. What the locals must have thought at the sight of all the legs hanging out of the windows as people took ANY vantage point to see the bands is anyone's guess!" After the success of the 1994 event, Jo decided to do it all over again the following year. The Whitby Gothic Weekend of 1995 was a slightly different beast. Although still centred upon The Elsinore (which remains to this day the main meeting point for goths in Whitby), some of the partying moved to the Metropole Hotel Ballroom, while the live bands played at the Spa Pavilion Theatre - a large, modern, entertainment venue overlooking the North Sea. Jo also started to recruit friends and aquaintances to help run the event - the legendary 'Top Mum's ickle helpers' were born. 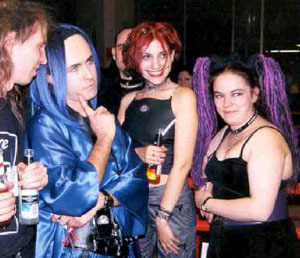 1995 was also the year the uk.people.gothic newsgroup started up, and the UK goth scene began to be increasingly networked by online communications. The WGW became adopted by UK net.goths as their real-life meeting point - effectively the UK's own Convergence. Sexbat (who originated the term net.goth) has been a WGW DJ since the event started. Tired of hearing about *last* year's Whitby gothic weekend? Whitby '95 - "Monsters of Goth"
"MORE! It's got to be MORE! And bigger, Whitby '95 yes, we'll get more bands, more goths, we'll arrange to have the sun turned off for the weekend, paint all the houses black, errr, yes, it will be easy; organisigingngng the last one was ok, a couple of phone-calls, ha ha, the bills they'll never make me pay, ha ha, twenty thousand bats, where can I get twenty thousand bats? Stuffed bats. In PVC, ha ha ha..."
Is your hair naturally crimped? Do you arise from your coffin with ethereal grace as the sun sinks? Is your eyeliner always f**king perfect? Do you KNOW you are the supreme goth? Are you essentially a pretentious git? `rock' nightclub needs you THERE! From 1995 on the WGW just grew and grew. In 1997 it became a twice-yearly event, with both Spring and Autumn weekends. Word about Whitby spread quickly, all around the UK and beyond. To a great extent the event has always relied upon word of mouth - after the initial flurry of publicity to get the Whitby-ball rolling, Jo has never pushed the publicity side of things very hard. She's never needed to - the WGW has a momentum of its own. The experience of Scary Lady Sarah, of Chicago's American Gothic Productions, neatly illustrates how the word-of-mouth process has worked - and how the WGW captures the imagination of its attendees. SLS first heard about the event from Gothpat - a friend from Chicago who now lives in the UK and helps out on the WGW info desk. Gothpat convinced Scary Lady Sarah to attend her first WGW back in 1997 - and she's been a regular ever since. "I look forward to the WGW more each time," she says. "As a matter of fact, at least two months before each Whitby, I begin signing my emails and internet posts with 'Countdown to Whitby' days. There aren't very many Americans who come over for Whitby, but we do bring a crew of at least six Chicago goths each time. I talk it up as much as possible and pass the photos around quite a bit." "Thankfully, when I first made it to a WGW (Halloween '97), it was the absolute opposite of pretentious vampire horseshit, and I had a ball. Unless I've got my years mixed up, I think it was Rosetta Stone headlining (which was why I went) with Faith & The Muse - I was blown away by how utterly superb they were. Great sound, great lights, great atmosphere - just how a gig should be. I stood there thinking 'I really must get to play here sometime...' As it later transpired, I did!" "One of the most striking things is the magical the atmosphere in the town. By that I mean that the people who are in Whitby for the festival are so welcomed by the local community. I had rented a flat with a friend, and the first thing we did was go to the supermarket. As we entered a woman employee held out a shopping basket to us, and with a genuinely warm smile she said 'I hope the weather stays fine for your Gothic weekend.' It was such a delightful surprise! I was expecting the usual glares you get in 'average-town' if you turn out in a goth outfit of some sort." "When I got there, I felt right at home. Initially, it was rather surreal seeing so many Goths in one place, but you soon got used to it. I find it rather endearing that so many locals were so Goth-friendly, especially considering the usual abuse I'd put up with in my home town which on better days involved 'townies' chucking full cans of lager out of moving cars at me." "It is a *safe* environment for this big party to happen. People can go to Whitby and they can dress up however they like, in whatever their fetish is, and they are safe. They are not only safe within the gig environment, they are also safe walking through the town dressed as they please. 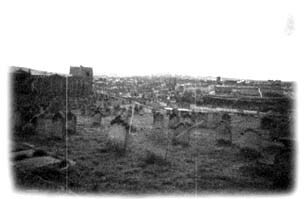 Many people who attend Whitby cannot feel that way in the town or city that they live in. I think that is very underestimated in the overall success of the festival." "There was a wonderful image that will always stay in my mind from my first visit. The flat we had rented was on the Crescent, overlooking a little park near the seafront. As we settled in I took up a seat in the window and watched the passing parade of people arriving and unpacking all sorts of bags, boots, coats and hats and all the paraphernalia that is 'goth' out of their cars. Then all of a sudden three goths ran after each other across the park; one of them, a slim androgynous girl wearing a crushed velvet top hat, suddenly decided to do a cartwheel across the park - hat and all. The hat stayed on and the others clapped. It was the most splendid image and will remain with me forever - it sums up the spirit that is the Gothic Weekend." "I really didn't know what to expect. Upon arriving I thought 'Bloody hell, this little town is *full* of goths, painted in black - Cool!' What I really liked about it was the warmth and friendliness of it all as well as the incredible fashion sense of everyone there. Not many places would tolerate goths with squeaky ducks and squids (anyone remember those?)..." "My favourite thing about Whitby is definitely the social whirl, seeing all those people I hardly ever see these days and catching up with news and gossip. Every time I go it's like I meet up with all those people from all over the UK and beyond, to catch up, chat, drink and pass out. 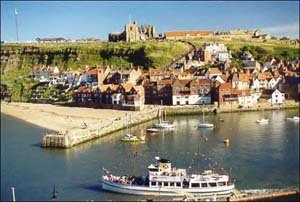 Having been to quite a few the big festivals around Europe (The Wave Gotik Treffen in Leipzig, Zillo, Eurorock, Gotham in Amsterdam) I can honestly say that Whitby is a class of its own. Why? Because it is the only one not purely centered around music. People who go to Whitby year after year go because of the other people who attend, because it's a lot more 'social' than a festival of 30,000+ people (like WGT) where it is simply impossible to do any sort of socialising." "I've been to the Wave Gotik Treffen and was overwhelmed by the enormity of it. It was amazing, but it didn't have the same comfortable feeling as the WGW. At Whitby, everyone recognises each other. You can easily run into everyone you know within two days. The town itself with the Abbey, graveyard and winding streets, is the perfect quaint location for a goth event." "I honestly believe that the majority of Goths treat Whitby as a social event. Because Goth is still slightly underground (at least in the UK), it's geographically spaced out and thrives on the internet probably more than it does in real life. Whitby is one of the few events that I, and many others, get to meet up with all my Goth friends in one place. It's nice meeting people with whom you've been chatting on the net or phone (sometimes!)" "I think the principal attraction of Whitby is that it's less of a gig, much more of a holiday for a lot of people. If you're a regular on the scene, I don't think there's any aspect of it which doesn't appeal to people. Whichever way you look at it: music, bands, people, socialising, clothes, alcohol... it's all there in one weekend." "The main attraction for everybody is that everybody will be there. A self-fulfilling prophecy. However, that does not mean that the entertainments and attractions are not important and it's great to see strong line ups on the band side of things - some top-notch established goth talent and also a continual stream of up-and-coming acts." Mike makes a good point there - because although many WGW people regard the event as a prime opportunity for socialising, it's still extremely important as a showcase for live music. Over the years, the WGW live music line-ups have featured just about every band which has any presence whatsoever on the contemporary UK scene - and introduced many new acts. The full Whitby band-list can be found on the WGW website. The fact that many WGW attendees don't actually watch the bands, preferring instead to socialise in the foyer of the Spa, has led to the suggestion that the WGW should be run as a club night, with DJs only and no live music. Jo herself is against this: "I get this one quite a lot - thing is you can go to a disco any weekend. I'm trying to give value for money and airing new live bands. I'd feel like I was cheating people to have a night with just DJs." That said, booking 'name' bands to headline Whitby is sometimes more difficult than you'd expect. The number of bands which have genuine headline status on the UK scene is not large at the best of times, and with many of the top contenders of previous years (Rosetta Stone, Children On Stun, Switchblade Symphony) having now split up, it gets more difficult every year to find a suitable band for the top spot. Although many WGW-ers may not realise this, Jo has approached assorted 'old-skool' goth bands (in various formal or not-so-formal ways) with a view to booking them for Whitby - and she has not been able to get a positive response out of any of them. Paradoxically, perhaps, it seems to be the G-word that puts the bands off. "I sometimes wish I'd called the event something else - not the Whitby GOTHIC Weekend," says Jo. "That word seems to close so many doors. People see bands like All About Eve on tour, playing small venues like Chelmsford Arts Centre, and they say 'Why don't you book them for Whitby?' Like I haven't ASKED!" Meanwhile, the number of 'current-scene' bands who have anything like the UK profile necessary to head up a relatively major event dwindles by the year. What d'you do when you've booked Clan of Xymox, Funhouse, Faith & The Muse, London After Midnight? Even booking the same bands for comeback slots isn't necessarily easy: the costs and logistics are often very difficult to sort out - as an ex-promoter myself, I'm acutely aware of the crazy hoops you sometimes have to jump through, just to get a good line-up for a show. With this kind of thing in mind, putting together good quality WGW band line-ups is often much more of a struggle than people assume - and whatever decision is eventually made, someone will *always* pop up to assert that it's wrong! 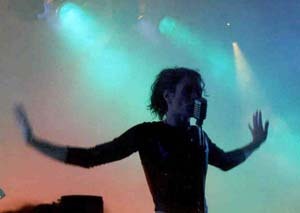 In 1999 Jo made a deliberate decision to put on a WGW that was slanted in the direction of electronic EBM/dancefloor music, with a line-up that included Sigue Sigue Sputnik (80s pioneers of the electro dancefloor sound) plus VNV Nation and Mesh (the current scene's main contenders in the electro field). This was always going to be a controversial choice, but given that this kind of music has become, to a great extent, the soundrack to a large chunk of the goth scene (some goth clubs play nothing else these days) there was a rationale behind the decision. 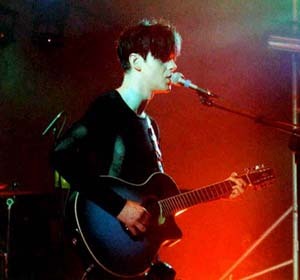 The storm of protest that erupted when the bands were announced took everyone by surprise - posting to uk.people.gothic, one of Jo's critics, Gary Beldon, even went as far as to say: "Personally, I think that this will help to kill what's left of the goth scene." Well, as we now know - it didn't. That particular WGW was, in fact, very successful. Valerie rates it highly: "The best WGW would have to be the event with VNV nation, Mesh and Sigue Sigue Sputnik. There was a truly fantastic atmosphere going on then. When that happens it spills over into every aspect of the festival." "I think that's because everyone sees Whitby as one of the highlights of their year. If the line up isn't quite what they want or expect, it's kind of like hearing that the hotel room you booked suddenly doesn't have the en-suite bathroom you ordered. I think it's a testament to the legend that WGW has become, and it's one of the few things that I don't envy Jo over." "If it wasn't for the people, WGW wouldn't be an attraction - because when you think about it some bands playing in a municipal pavillion miles from the nearest big city doesn't make any sense. That's why I feel that it's right that everyone involved should have their say, or a good old moan on the bands, etc. Given that you can't please everyone, then that particular topic regularly provides some healthy discussion. As long as people care enough to voice their opinions, then Jo's obviously doing something right!" So, what's it like to be a band, playing at the Whitby Gothic Weekend? The only people who can answer that are the bands. So, let's ask them. "November 1999 was the first time I went from punter to performer. You KNOW there's a lot of people there, but once you suddenly get on stage up above them it's STILL a shock to see just how many. I know Polly [Narcissus Pool guitarist] went on stage before me muttering 'Don't look at the crowd. Don't look at the crowd!' I watched him then look at the crowd - and his knees went off like spaghetti! I know the first thing I said into the mic was 'Jesus Christ!' I had something witty lined up to say, which to this day I've never remembered. I know it's not many people compared to Euro festivals, but it's still the most people I've ever had ALL looking at me. I'm really pleased we're doing it again this year because it was such a mindfuck first time around that I only started to enjoy it with two songs to go. From a band point of view, it is THE show to play. It doesn't necessarily give you a leg up because you'll always be judged on how good you are, but it makes a serious difference to a band's profile if they can pull it off. Once you've headlined Whitby, you get the feeling there's nowhere else to go Goth-wise short of abroad. Being on stage at WGW is an experience, and it is different to other festivals...there are no gaps in the crowd for a start, and the faces stretch out past the speaker stacks on both sides. People are generally more up for a good time at Whitby than anywhere else, so you generally find it easier to get the crowd going. The fuckers who refuse to dance and mope in the corners at their home town gigs start bouncing off the walls at Whitby - it must be something in the beer!" "Playing Whitby is a hell of a buzz and a great atmosphere - something which isn't always the case at other UK events. That could be because you're guaranteed a big audience in a party mood, or because of the build-up to the event, or possibly because a large proportion of the crowd have been drinking since breakfast time! Either way, I love it. For me, it's the only UK gig that even comes close to replicating the atmosphere you get at European events, which on the whole are much bigger. European audiences are generally much more likely to travel to see bands they like, regardless of how well-known the band generally is, and much less likely to stand quietly at the back when they get there. It's no secret that Europe is my favourite place to play and Germany in particular - it's a totally different experience to UK gigs - but Whitby redresses the balance and I look forward to it immensely. For any band, Whitby is the chance to introduce yourself to the best part of the whole UK scene in one go. So for up & coming UK bands, or bands from abroad who want to establish themselves over here, it is an essential 'leg-up' and the chance to get the attention of people from all corners of the UK that you otherwise couldn't do. It's also an opportunity to play on a great stage with a quality PA, lighting rig and crew - so you can show your best side and people can hear what you're really capable of. I'd say that could have more of an effect on how the band is perceived afterwards than anything else, if you're relatively unknown beforehand. The status of the event is certainly good to have on your CV when looking for other opportunities and can attach familiarity to your name - but whether or not you're perceived as being a bigger band, I couldn't say. I suppose you'd better ask the audience..."
"Playing Whitby is in many ways like doing a 5 date tour in one night, as you can be up in front of 1000 people from all over the country (and Europe, too). That's why bands leave with a bigger profile, because they reached a lot of their potential audience in one fell swoop. Also, it gives you a chance to 'up your game' in front of a larger crowd and I think that most bands manage to do this. Most underground bands work really hard on their sound, despite of the lack of record label finance and hand-outs and Whitby gives us a chance to stick two fingers up at the establishement and show that we don't need them! For us, playing Whitby is always an honour and even though we've had more than our fair number of goes we're always very grateful to be there. Our situation is a funny one - even though we have established ourselves in the upper echelon of UK acts over the past 7 years or so, we are still very much a well-kept secret and I believe a bona-fide goth underground band. To that end Whitby is the place to play and the place to be seen." So, if the Whitby Gothic Weekend is the principal social event of the UK scene, and a good event for bands to play in terms of raising profile and getting ahead, how does it rate for those involved in goth-scene businesses? "The WGW is *extremely* important for business - it's the only time we'll get maximum numbers of Goths in one place at one time (albeit it in the pub!) Goths come to WGW with the intention of spending money. They don't care what it's on but they feel hard done by if they don't spend it and return home to find letters from their bank manager on the doorstep! My boyfriend promised not to spend a penny last year and went home with over £200 worth of clothes!" Meltdown gets a bigger turnover in two days at WGW than we get anywhere else. At no other festival, gig, shop etc would I personally sell over 150 copies of my mag in a 2 day period! And of course, word spreads at WGW so you have to strike early. Strike with your stock on Thursday afternoon and by Friday evening, everyone knows about it!" "The disposable income at Whitby is astronomical, and I've twice taken well into four figures while running a stall there. My next best at a goth event is about £400 which puts it in some kind of perspective." There's certainly a 'shop till you drop' atmosphere about the Bizarre Bazaar, and for many goths it's the only chance they get to look over the wares of goth-businesses from around the UK, many of whom converge on Whitby. As Natasha says: "It's pretty much the only time I get to see the stock of places like Vagabonds, Morgana, Void and Noctule. I'd be lying if I said I didn't enjoy the shopping part!" We've established that the Whitby Gothic Weekend is, in many ways, a unique event. But has it had an influence on the way things are done in the wider world? Has the 'Whitby way' carried over into the world of goth at large? Certainly I'd say that the humourous, irreverent approach of the WGW has filtered into the UK scene in general. There's always been a strand of humour running through UK goth, but in the mid-90s this was in decline, swamped by the self-consciously 'Serious Rock Band' approach of such creatures as the Mission and Nephilim. The WGW found the humour-volume control of the UK goth scene, and gave it a definite tweak upwards. "I reckon WGW has put more emphasis on all-dayers as opposed to gigs - people like to think they're getting their money's worth. If you have to spend £6 or £7 just to see 3 bands, it seems to make more sense to spend another £5 or £6 to see about 8/9 bands on an all-dayer. And I do think this has had an impact on smaller gigs. Certainly numbers have dwindled dramatically [at ordinary gigs] since the increase of all-dayers and promoters seem less prepared to put on a basic gig. I guess it's more cost-effective to run bands all day if you've paid for a venue and you know some of the smaller bands will play for beer money." "The rest of the year, the scene does struggle, but this isn't soley down to Whitby. From a band point of view, gigging round the UK is becoming less and less necessary provided you can play a couple of decent festivals. For example, you can play a gig a month in the UK, at regular goth nights, and still play to less people all year than you would if you played Whitby once. Less people are supporting local nights and gigs, and are content to just attend three or four festivals. Because the scene remains so small, the festivals have sort of killed the gig circuit." "This is something which I am a little concerned with as I personally think that there is no need for all of these festival-type gigs. To me, they are just gigs - because there's not the other magic ingredient which is required to turn them into festivals." "There are indeed many festivals but how can those compare to Whitby? Not in the slightest. Totally different things. Whitby has probably set the boundaries as to what a UK goth festival can look up to, but I do not think people who are behind the one-dayers want them to be *like* Whitby (this can't happen anyway and I don't think they are any close to it happening). It's probably a case of 'enriching' the scene with more and more events in their own rights. Gigs happen and have happened whilst the WGW has been running and I don't see the two as mutually exclusive." "Every time I return home to Chicago after the WGW I'm re-energised about goth in general. I've had such good times [at Whitby] that I try to keep that going at home. I'm the total goth cheerleader for weeks afterwards! Our Saturnalia event has been growing each year and I'd love to expand it to two full days by next year - like the WGW. The Whitby crowd does generally dress better than US goths, and I bring back photos to hopefully influence our own punters!" So - how can we sum up the phenomenon that is the Whitby Gothic Weekend? Is it possible to sum it up - should we even try? Jo Hampshire's simple idea to take a bunch of goths to the seaside for a party has grown beyond anything she could have envisaged in 1994 - and yet, essentially, the idea remains. It's *still* a bunch of goths having a party at the seaside, and I think it's this simple idea at the heart of the event that makes it work so well. There's no grand concept, no high falutin' strategy - ultimately, it's just a party. But *what* a party! Scary Lady Sarah describes her Whitby experiences in a nutshell like this: "Looking good, dancing a lot, sleeping little, the best two weekends of the year! Spending all my money on CDs. Aching feet because I never remember to bring sensible shoes!" Natasha homes in on the WGW's international appeal: "When people from other countries come to WGW they come for that Englishness - that's what they find so appealing. The English music, English fashions, English booze... maybe because England has such a strong pub culture, which forms an undeniable core to the gothic weekend itself, it makes it infinitely more sociable and appealing. It's quaint!" Justin of Passion Play manages to wrap it all up in a neat one-liner: "A meeting of minds, music, make-up and mayhem. By the sea." Phill: "It's all contradictions...hangovers, fun, exhausting, exhilarating...People treat it as a holiday, but you need a holdiay to recover from it!" Mike: "The only way to understand Whitby is to be there, so wherever you are - make a point at being at the next one because there really is no substitiute!" "It's a big party, held on a weekend away from home. You've gone with all your mates and it's all done in such an outrageously fun style that you simply want to be part of it, forever."